Holly is a genus of 400 to 600 speciesof flowering plants in the family Aquifoliaceae, and are evergreen and deciduous trees, shrubs, and climbers from tropics to temperate zones worldwide. They are renown for being Christmas plants and for their appearance in traditions around that time. So can rabbits eat holly at all? Unfortunately, they cant eat it all. 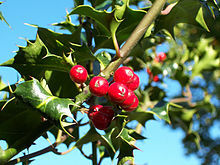 Holly is poisonous to rabbits and will harm them if it is eaten. Can rabbits eat holly berries? Unfortunately, they cant eat holly berries. They too are poisonous to rabbits.